The absolute best location in Palmas! The closest to the beach in Crescent Beach! Fully equipped, and free internet access included, with private Wi-Fi so you can take your laptop into the ocean if you so wish. The studio is a comfortable 640 sq ft, ideal for a romantic getaway, or maybe a couple with a small child. Crescent Beach is the jewel inside Palmas del Mar. The complex provides three private pools and beach concierge as well as beach chairs, lounges, some with umbrellas so you can control your tanning. 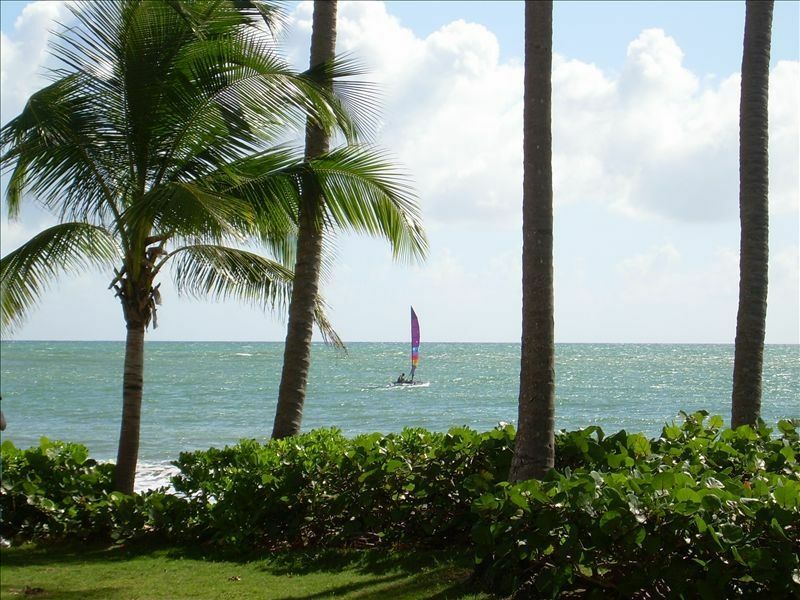 Palmas Del Mar is Puerto Rico's fastest-growing, resort/residential community with over 3000 full-time residents and a thriving vacation ambiance. The property encompasses 2700 acres with 600 hectares designated as wildlife preserve areas and has miles of walking, jogging and golf cart paths. Palmas is located just 50 minutes from the fabulous shopping and 500 years of history of Old San Juan. It is an easy drive from Palmas to the El Yunque National Rain Forest (45 min), world-class Luquillo beach (30 min) and the natural wonder bioluminescent bay in Fajardo (25 min). But then Palmas alone can keep you busy! Several boat charters operate from the Palmas Marina offering half and full-day sails to Vieques and Culebra -the Spanish Virgin Islands. Between November and April, our wahoo run compares to that in the Bahamas, with fish available just 2 miles offshore. There are 2 championship golf courses designed by Rees Jones and Gary Player, a casino, equestrian center, SCUBA charters and more than twenty tennis courts (hard, clay, and synthetic grass) all within the resort's grounds. Instructors are available. There are more than 15 different restaurants within the resort grounds, from Flying Pizza to Chez Daniels. The beach area just in front of Crescent Beach is the best section of beach in Palmas Del Mar, protected from the prevailing swells by a natural reef a quarter-mile east of the complex. This reef is visible in the satellite Google Maps views described below. To see the villa's location, access Google Maps and search for Palmas Del Mar, Playa, Puerto Rico. Switch to satellite view, and tab the map right (east) and up (north) until the two C-shaped complexes come into view, on Montesol Drive. Crescent Beach is the C-shaped complex on the right when looking from the ocean. Our villa is right on the left corner of the complex, Google Earth coordinates: 18*05"21.94"N, 65*47"35.49"W.
You just cannot legally be any closer to the soothing sound of the waves! Puerto Rican native who loves the island and its beautiful beaches. Chemical Engineer by profession and adventure traveler by vocation. Worked over 25 years in the pharmaceutical industry and now living the dream. Blessed with the opportunity to own this amazing studio in such a unique and privileged location. Palmas del Mar is a great community. Resort-living at its best. And Crescent Beach is the jewel of Palmas. 20 courts, some lighted, available for a fee at the Palmas Athletic Club. 2 courses, available for a fee at the Palmas Athletic Club. Palmas del Mar is a nice community w restaurants, fishing, and snorkeling tours. This unit could use some updating. Tiles are cracked. Furniture is very worn. Location was excellent. Thanks for your review Elizabeth. We are glad that you seem to have discovered quite a bit of what Palmas del Mar has to offer. We are also pleased that you enjoyed the unique location of our villa. Having said that, we feel disappointed that perhaps we could have done more to make your stay even better than OK and more 5-star like for most of our previous tenants. We wish you had let us know while you were here. We are also sorry you did not like its feel and look but respectfully disagree with your assessment of our natural rattan furniture. With regards to the two cracked tiles in the shower, we agree with you and fixing them is part of our next summer (lo-season) maintenance plan. Hope you can come back and truly enjoy Paradise soon! First floor villa with unobstructed view of the ocean. Comfortable bed, plenty of clean towels and linens, adequately equipped kitchen made the stay comfortable. We were a 30 second stroll to the pool or beach, lulled to sleep each night by the crashing surf. The villa location is such that very few people walk buy...a plus for privacy. All in all a wonderful stay at comfortable condo in a stunning location. The owner was easy to communicate with and always quick to reply to our emails. Thanks Pedro! It was a great experience. Palmas del Mar is a paradise and has a lot of things to do. Crescent Beach is a great villa to stay. Overall our experience was very good. This is a perfect condo for two people. The location was right on a beautiful beach. During the week we had the beach and resort to ourselves. On the weekend it wasn't too busy at all. We enjoyed the swimming pools, especially the one with spa like jets. If you want to get away from it all and just walk straight out your door to the beach, this is your place. They have beach chairs and coolers for your use. The owner, Pedro, was accommodating and made process very easy. I would stay here again. This unit is as described; perfect for the two of us. A second TV has been mounted above the kitchen table so you can watch from anywhere in the unit. The ocean view and beach are beautiful. We toured around the island, but upon returning wondered, "why did we go anywhere, it is so beautiful here and we have everything we need". There is plenty shade and sun just outside the front door. The rental process was easy. The owner was very pleasant and followed through with everything he said. The Palmas Del Mar resort complex has many amenities for those who want to stay withing the complex. Just 15 minutes by car and you'll be at WalMart, Sam's Club, Walgreeens. Having come from Florida, this was a real convienience. Although we live in beautiful Florida this place is a tropical paradise worth visiting. My wife & I had the pleasure of staying in Pedro's condo a couple months ago and the experience couldn't have been any better. The condo unit, while on the small side, is perfect for a couple seeking peace & quiet. And, the setting/location...Absolutely STUNNING!! Walk out the front door and you're literally only a few steps from the beach. Pedro is very attentive, communicates freely and handled a maintenance issue with the A/C very quickly. I would definitely return to Palmas Del Mar and stay at Pedro's condo again. Golf Carts Available for Rental to Cruise Around the Resort. the Biggest Problem You Will Have is Deciding Who Gets to Drive! All utilities + cable + internet + parking are included. You will find the unit clean and we shall clean it after you leave, inc. in rental All we ask is that you take care of it as if it were yours.